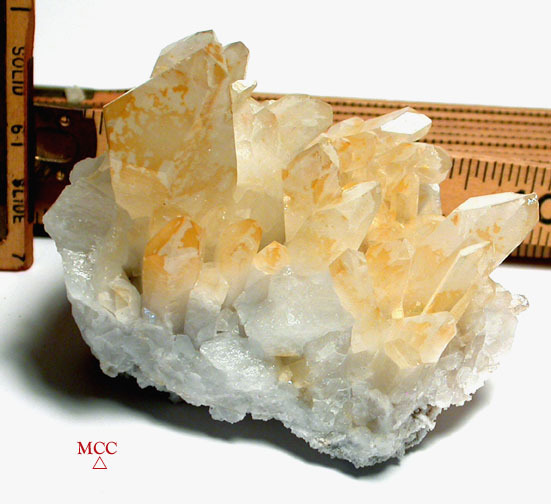 Natural iridescence, white titanium overlays, and many many record keepers distinguish this RED golden healer Arkansas rock crystal cluster. The luck of the draw included more deeply colored iron inclusions, making a rather rare category even moreso in this cluster. 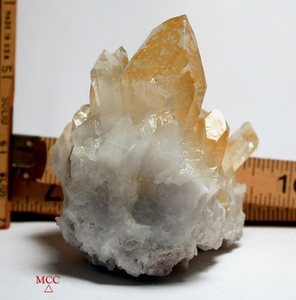 Now, two crystals have facial damage as well as the main transmitter having a slight graze, and that has been priced into account. We also notice the Isis faced penetrating crystal next to the main has an uncommon 7h face; one behind those has a tiny diamond window. Good for your collection of rarities, not to mention your heart chakra! 2-3/4"x 3-1/4"x 3-1/4" high on a sandstone/microcrystalline base.